When her husband received his appointment to Special Forces no one asked Donna Stube to raise her right hand and repeat the oath given to all new Green Beret soldiers. Her commitment and future sacrifices were to be none-the-less shared as her husband was deployed time an again in the dangerous places these elite soldiers serve. Donna, like thousands of other military spouses left behind are going about the business of raising families, paying bills, and in short maintaining the very culture her husband was off fighting (and risking his life) to protect. Donna was selected for this trip to honor her service as a spouse of a military service man who was severely wounded in battle in Afghanistan in September 2006. Greg’s injuries threatened to take his life and his nearly 2 years of recovery became the sole purpose of Donna’s efforts. In addition to attending to their infant son Gregory, Donna, like so many other military spouses, unselfishly put on hold her own plans and ambitions and devoted herself fully to her injured husband and young family. It is a very heavy load that military families carry for the benefit of all American’s and Donna’s story is not unique in our country. Thousands of other military spouses find themselves in supporting roles that often go unnoticed and under-appreciated. All too often the burden becomes too great and the result is a shattered family. 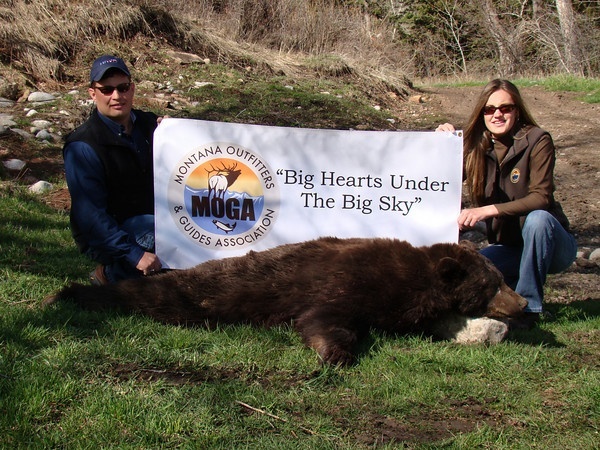 The trip was sponsored under MOGA’s Big Hearts under the Big Sky program and our affiliate HAVA (Honored American Veterans Afield). Ruger arms and Beretta donated guns and gear to the effort as well. Mike and Mona with Rollin Boulder Outfitters and MOGA members hosted the trip and created a family environment for Donna and her husband Greg who came to support her. Every meal was family style with the Lovely family including their children and extended family members. 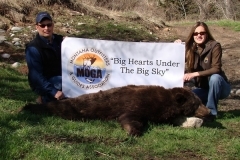 Mike and his father Don and Mona’s father Bob all worked very hard to find a great spring bear for Donna. Hours were spent glassing and several stalks were made. 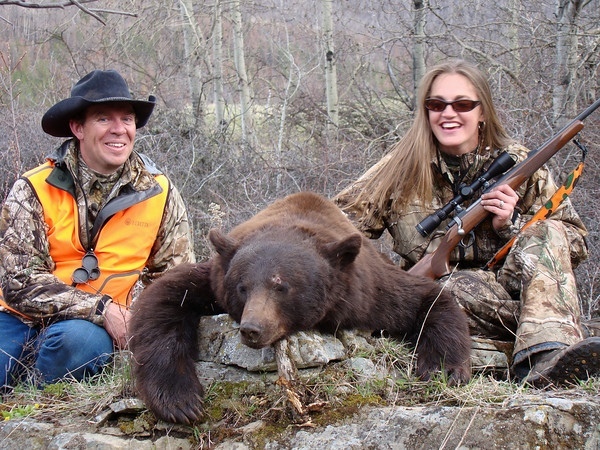 Anyone who knows spring black bear hunting in Montana appreciates what a challenge it can be. This group of experienced outfitters was able to get the job done safely and have fun doing it. Mike said that Donna’s bear is the biggest he has helped take in his career. 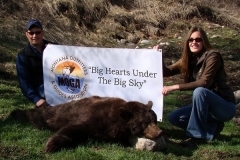 Donna made an exceptional one shot kill on this bear at around 200 yards using a new rifle given to her by Ruger Arms. Within the Big Hearts under the Big Sky program, MOGA members teamed up with HAVA to provide military service men and women who have provided extraordinary service to their country. We do this in a manner that includes the family in an effort to create an environment that allows them to reconnect as a family. This is a powerful program that touches the lives of all involved in a very positive manner. “I know I speak for all of MOGA when I say that it is an honor and a privilege to afford a trip like this to Donna Stube in recognition of her efforts to support Greg and her contribution to his service to our Nation” said Mac Minard Executive Director of MOGA. The entire hunt was filmed by ORION Multimedia and will be aired on national TV sometime this year.